This article complements "Security Walls and Suicide Bombers." 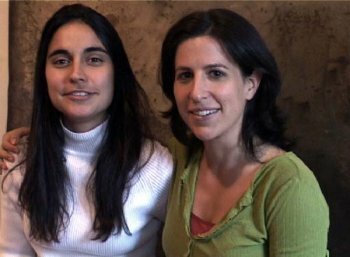 IE interviews Ronit Avni, founder of Just Vision, an organization that increases awareness of peace-building Palestinian and Israeli nonviolent, civilian-led efforts for the Middle East, and producer of Encounter Point, a documentary film about these efforts. For more information, visit www.justvision.org. IE: What inspired you to found Just Vision and produce your documentary Encounter Point? Avni: I had been in the field of human rights since 1999. I was an intern and volunteer at two prominent Israeli human rights organizations, B'Tselem: the Israeli Information Center for Human Rights in the Occupied Territories, and PCATI: the Public Committee Against Torture in Israel, and later I worked as program associate for Peter Gabriel's human rights organization, Witness. From 1999 to 2003, I was primarily engaged in documenting violence, abuse and neglect, in the Middle East and in countries such as Senegal, Honduras, Afghanistan and the United States. At Witness, part of my role became to train human rights organizations to document violations using video and to strategize with them about effective uses of video for social change. I loved the work as it was at the intersection of technology, film, human rights advocacy, and public policy. It was also tremendously humbling to meet so many courageous people. I was particularly inspired by indigenous rights advocate Joey Lozano from the Philippines, the Afghan women's rights activists from RAWA and youth of color working to increase funding for schools rather than prisons. All of these groups demonstrated civic leadership in their communities despite personal hardship. They were not politicians, yet they had a sense of agency and urgency and this led them to get involved. They inspired me to look for Israelis and Palestinians doing the same within their own societies. This was the beginning of my journey to launch Just Vision. Through my experiences at Witness and in life generally, I was struck by how influential films are in shaping our visual vocabulary of places and people. Films have the power to move you emotionally and to remain with you for far longer than texts. Yet Encounter Point is one piece of a broader effort to raise awareness about Palestinians and Israelis at the vanguard of a movement to promote nonviolence and peace building. The film was never meant to emerge in isolation from the rest of Just Vision's work. From the beginning, we wanted to create in-depth materials online to complement Encounter Point, since no 90-minute film can ever do justice to the painful, divisive and complex Israeli-Palestinian conflict. For this reason, we are interviewing 180 peace-builders and publishing this living history archive online at www.justvision.org together with educational curricula and a timeline of the conflict through the lens of these 180 people who are committed to ending it. We are also trying to connect such peace-builders to policymakers, journalists, community leaders, religious figures and more. We've taken our work to members of the U.S. Department of State, Capitol Hill, the World Bank, the Oprah Winfrey Show, temples, mosques and community centers, to name a few. People tend to focus on the film, and to remember and talk about the film because of the strength of the medium. How did your experience in Israel affect you? Did it influence you to start Just Vision? I am an Israeli citizen, but I was raised in Canada. My father returned to Israel in 1993 or 1994, at the start of the Olso process, and I have been back and forth ever since, including living there for a few years. Every experience of Israel since childhood has affected me, but differently. My familial, linguistic and social ties preceded my political awakening so some of my associations with Israel are quite deep. I always identified more as a fusion of, or bridge between, North American and Israeli culture than a Montreal local or Israeli. I feel like I am somewhere in the ocean; I can understand the two realms but I am not fully identified with, or immersed in, either one. In a way Just Vision reflects that sense of place-we seek to leverage our access as a North American-based entity to widen the influence of Palestinians and Israelis engaged in peace building. Our staff operates out of three offices: Washington, D.C., New York City, and Jerusalem. We could not function without access to media, contacts, and supporters in North America as well as to local support in the Middle East. I think my most transformative, sobering and difficult experiences in Israel occurred when I was volunteering at two human rights organizations as well as studying the history of the conflict. Working in human rights on this issue, you develop a vocabulary you wish you would never have use for; words to describe torture, degradation, assassinations, discrimination, and abuse. It is painful to confront what we human beings are capable of. It is especially painful if you were taught to hold your community or society to high standards of moral conduct. The dissonance can be destabilizing. I interned at B'Tselem in 1999, during the Oslo process. It was eye opening. A field researcher, Najib Abu Rokaya, was kind enough to take me with him on various occasions to the West Bank as he collected testimonies of Palestinians whose homes had been destroyed or whose child had been hit by a rubber coated steel bullet. At the time the intern coordinator introduced me to the Public Committee Against Torture in Israel (PCATI) so I would split my time between my own research, PCATI and B'Tselem. I think what struck me was that communities who lived 10 or 15 minutes apart from one another had virtually no sense of the other's perspective. It isn't a unique phenomenon-there are plenty of communities in Brooklyn or Manhattan that never interact, but it really affected me. B'Tselem gave me the opportunity to see through these two separate lenses. I have tremendous respect for their work. It is never easy to hold a mirror up to one's society. Many prophetic voices have been killed or ostracized over the generations for critiquing dominant views or habits, and yet such voices are essential to our growth as ethical human beings. B'Tselem holds a mirror up to Israeli society. Those who take the time to read their reports see a picture that is less than flattering. I also started reading Stanley Cohen's work during that time about different ways that societies deflect responsibility through denial, or rationalization or by displacing blame. I was seeing this play out in the public's responses to B'Tselem. On the issue of Israel/Palestine, audiences' defenses are up. We have a joke at Just Vision that people already know what Encounter Point is about before they watch it because everyone has already formed an opinion about the issue, about us, about our subjects... My hope with Encounter Point and Just Vision is to cut through some of the cynicism and apathy which is both disempowering and counterproductive. We tried to make a film out of love and empathy, not anger, without glossing over core issues or creating false parallels between the two sides. That is how we approach our work generally. How does being Israeli-Canadian-American make you feel about the conflict in Israel and Palestine? Again, as an Israeli-Canadian-American (American being the most recent identity in the last couple of years), I feel a sense of responsibility to the current conflict, a sense of connection and perhaps a sense of agency. Being in the United States, which is not where I was born or raised, you develop a sense that you can accomplish a lot, that you have the ability to transform your environment. That may be part of the illusion of the American Dream, but it is infectious. When I came to the United States I did indeed feel that I could dedicate time, energy, and resources to getting involved constructively. I don't think I had as strong a sense of possibility or agency prior to coming here. Being here, I also feel a sense of responsibility since the U.S. government takes an active role in this conflict-both in providing the weapons that lead to its perpetuation, but also in attempting to mediate. Why is peace important for the region? I think that is quite obvious: for people to flourish and to live safe, dignified lives. In the grander schemes, it is important for civilization-for us to start to move beyond using force and power to resolve conflicts. It is important for geopolitical stability since Israel/Palestine is such a tinderbox. It is a geopolitical epicenter and when it explodes the whole world, especially the monotheistic populations, feel the reverberations. On a basic level, both Palestinian and Israeli society have so much to offer the world, themselves and each other if they could move through this bitter conflict. It is painful and infuriating to watch. How did you choose subjects for your documentary? This was a long and arduous process. I conducted 485 preliminary interviews in two years of pre-production research. My colleague, Nahanni Rous, had numerous contacts through her work as a journalist and on account of her then-fiancée (now husband) who was also a peace-builder in the region. We started following about 16 individuals and narrowed down the film to four main subjects and four supporting subjects. I came across Robi, an Israeli bereaved mother; she is a friend of my cousin's who is also bereaved. While following Robi, I came across Ali Abu Awwad, a Palestinian bereaved brother who was so charismatic, articulate and compelling that we chose to continue to document his work. Julia Bacha, the writer/editor and co-director of the film, thankfully insisted on continuing to film an individual who we had been following. If not for her he would not have made it into the film. Producer Joline Makhlouf built a relationship of trust with George Sa'adeh, of the Bereaved Families Forum. In short, it was a team effort that began with years of research and lots of patience. Was it difficult to convince them to talk to you and be filmed? Because many of our initial contacts were through friends, family or friends-of-friends, we gained initial access and then spent years investing in our relationships. There were a few people from the Orthodox Israeli community who asked that we not show their faces on film not for religious reasons but for fear of ostracism. I raise this because the common question we are always asked at film screenings is whether the Palestinians were facing threats or feared for their safety as a result of the film. No Palestinian ever asked us to conceal his or her identity for this film, even though they knew we aimed to show it on Arabic satellite and Israeli television. Why did you do this project? I wish I could answer that simply. I tried to move away from the Israeli-Palestinian conflict when I started working at Witness but I found that I couldn't. I feel deep connection to so many people and places on both sides of the Green Line that I refuse to give up on this region just yet. Sometimes you almost want to walk away because the headlines read like a tragicomedy of errors, but I can't. And I don't believe we've tried everything. So long as there are intelligent, capable Palestinians and Israelis willing to work for peace-and there are thousands of them, I feel the global community has an obligation to support them. I think I have something to contribute in the realm of media and awareness raising so this is where I choose to devote my energies. I just want to reiterate that while Encounter Point as a film project is complete, Just Vision, the organization that created Encounter Point continues to operate. Can you share some of the highlights of producing this documentary? There are so many highlights: researching the large number of inspiring people from both societies who refuse to sit back and let their children inherit the conflict. Working with my colleagues-we are a core team of young women from Israel, Canada, the occupied Palestinian territories, Brazil and the United States-who have forged unbelievable bonds of trust, respect, and love. There are too many highlights to mention them all but some of them that are the most memorable include going with Ali Abu Awwad, a Palestinian former prisoner and nonviolent leader who is one of the main subjects of the film, to a juvenile detention center in California to talk with former and current gang members about nonviolence and later discovering that some of the most hard-line characters in the film have subsequently become active in peace-building. Seeing responses from such a diverse number of audiences and watching as it cuts through biases, cynicism and arrogance is fulfilling. Above all, the experience has been about relationships-between people and communities. This film has been a collective process from the beginning. How did you meet Julia Bacha and how did she get involved with the project? I started researching Encounter Point in 2001 and began shooting in 2003. After seeing Control Room, I was struck by the way the various stories were told. I felt that the film did not dehumanize anyone, despite having a particular point of view. I contacted the director, Jehane Noujaim, to ask to work with her co-writer/editor and she referred me to Julia. Julia was initially brought on to Encounter Point as both a writer and an editor. I was looking for a creative partnership to craft the film's structure and storyline. Given her experience at Control Room, editing a compelling film with multiple perspectives from Egypt using 250 hours of footage in Arabic and English, I felt it was a good fit since we had the same cameras nearly the same amount of footage in Arabic and Hebrew. Julia was brought on in September 2004 to begin editing the footage. We moved to Jerusalem together in October 2004. Julia soon became an integral part of the team, working alongside the two other producers and myself in the field since we continued to shoot. It soon became apparent that her input was not solely in the editing room, but also in the field. Given that she was shooting, editing, writing and working with me to shape the direction of the film, I felt it was appropriate that she receive the sole co-director and writer credit. I maintained the sole director credit as well as producer (with Nahanni Rous and Joline Makhlouf) and executive producer (with Jehane Noujaim, who has become a key advisor to the project). How has this film been received? It has been really amazing, actually. We received the audience award from the San Francisco International Film Festival. We also were ranked fourth among 99 documentaries at Hot Docs. We have been invited to the Jerusalem international film festival, Atlanta and others. Al Arabiya, a 24-hour news channel based in Dubai, ran a segment on Encounter Point. We screened the film at the United Nations (UN) in June as well as to a conference of Israeli members of parliament and Palestinian Authority members in Moscow. We are also showing excerpts to 40 Palestinian and Israeli nongovernmental organizations who are looking for strategies to become more effective in peace-building. We have had a few difficult moments, though. My favorite experience is to show the film to a mixed audience. That's often when someone will stand up and say, "I think it is biased towards X," always referring to the other group, and then someone from the 'X group' gets up and says, "I think it was biased against us and toward you." Then the dialogue begins and audiences see that the conflict is provocative for those who care about it, and that there are challenging moments and rewarding moments in the film for nearly every audience, including those with no relation to the issue. Generally, it has been incredibly well received, though in the limited test screenings we've held. How do you think doing this documentary can positively affect the region? What other things do you think need to be done? What are your future plans? In Encounter Point and at Just Vision, we choose to focus on the people who engage in the slow, steady, unglamorous task of peace-building regardless of who is in power. So many people tend to focus exclusively on politicians. That is understandable, of course, since they have the capacity to propose and implement policy changes quickly. Yet, peace building must continue in order for peace to hold. Through Just Vision, I hope to strengthen the voices of those who are trying to build a culture and consensus that favors nonviolence and peace. This will take time, but it is essential. On a small scale, we are developing curricula for use in U.S. classrooms and hope to do the same in the Middle East. We are planning to publish lessons on the themes of nonviolence, civic leadership and peace-building. We hope to broadcast the film on Arabic satellite, Israeli, North American, and European television with follow-up debates or discussions and to press for more coverage of peace builders. If this film can connect audiences to local Palestinian and Israeli nonviolent peace builders, if it can challenge assumptions, humanize all parties without glossing over the complex reality, then that will be significant. People are so deadened these days-feeling there is no hope, that they have no power and that there are no prospects for change. What Encounter Point tries to achieve is to raise the prospect that there is movement-under the radar and on a small scale but nevertheless a genuine precedent regarding civic participation in peace building. Now we want the journalists to report on such stories. We want newspapers to print them and broadcasters to devote more time and energy to the less sensational but essential stories about civic participation and peace building. We want politicians and institutions like the UN and the World Bank to engage with civil society groups from the region who are peace building. There is so much that needs to be done. We need to encourage our media and politicians to take into account the needs of both societies, not one above another. We need to demand more complex, nuanced information, and accountability from the politicians who purport to want peace but do little to advance it. Social change is slow. Policy is immediate and wide-ranging in its impact so it feels urgent to report on. Grassroots work is ongoing and develops over years or decades, Sometimes we take this for granted and don't bother to stop and say, "Wait, this is important." We have yet to fully appreciate the impact of this type of work, though. The Israeli movement to withdraw its troops from Lebanon began with small grassroots organizations and networks of mothers and then soldiers and others who wanted to see change. It took two decades, but it finally happened by and large. These movements take a long time to take root, and to enter into public discourse and ultimately to reflect the mainstream. This was originally published on www.nafsa.org/webextra. Articles may not be reprinted without permission from the publisher.